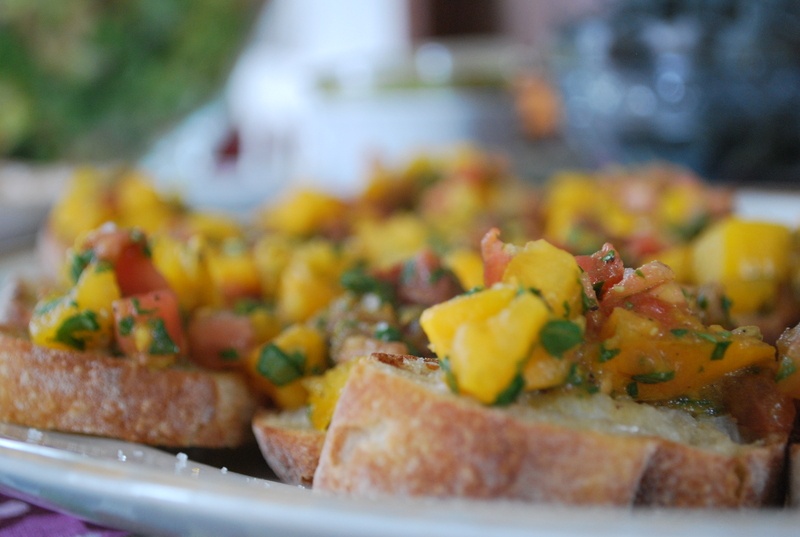 I fell in love with bruschetta when Andrew and I lived in Tuscany many moons ago. It was always on offer with the antipasti and seemed to just scream Italian authenticity and yumminess. Thank goodness it’s vegan because it would be hard to give up. I served it on Saturday when a whole whack of people showed up for a light Easter lunch – served alongside vegan cesar salad (with chicken on the side for those that wanted a chicken cesar), mushroom crostini, and a hearty olive boule. Place sliced baguette on a cookie sheet and toast in the oven until brown and crisp. Meanwhile, toss chopped tomatoes, chopped basil, olive oil, and sea salt and pepper to taste. Set aside. When baguette is toasted, rub each slice back and forth a few times with a garlic clove to coat in garlic (one clove will do for about 5 – 6 slices). Once each slice has been adequately “garlic-ed” top with tomato mixture, sprinkle with a dash more sea salt, and serve immediately.